Sign the petition to call on policymakers to invest in Minnesota's future! The Main Street Alliance of Minnesota works to provide small businesses a voice on the most pressing public policy issues in Minnesota and nationally. Our advocacy promotes vibrant businesses and healthy communities, and fosters leadership development of socially responsible business leaders. The Main Street Alliance of Minnesota strategically advocates for issues of concern to small business owners and the community; we help our members to be more effective businesses and socially responsible community members. SIGN UP to learn more and get involved! The high cost of healthcare is creating an increasing strain on businesses, families, and our state budget. We need to strengthen and improve the Affordable Care Act for individuals and small businesses, but the state reinsurance program passed in 2017 is a costly and inefficient short-term fix that may only stabilize — not decrease — health insurance costs. We support legislation to allow individuals and small businesses to buy into MinnesotaCare as an additional, public health insurance option. Investment in our Communities: It's now time to invest in strategies that lead to broader prosperity and allow all Minnesotans to fully participate in the economic recovery. Budget choices should prioritize items that benefit everyday Minnesotans across the state. These investments will pay off by building the quality workforce and high standard of living that have been the keystones of Minnesota's economic success. Child Care: Main Street Alliance of Minnesota recognizes an important relationship between a stable, supported workforce and accessible, affordable, high quality child care. Child care is a cornerstone of ensuring a healthy economy. Investments should be increased in affordable childcare options and flexible funding streams. Housing: Housing is an integral part of Minnesota’s economy and a key workforce retention tool for employers and the state. 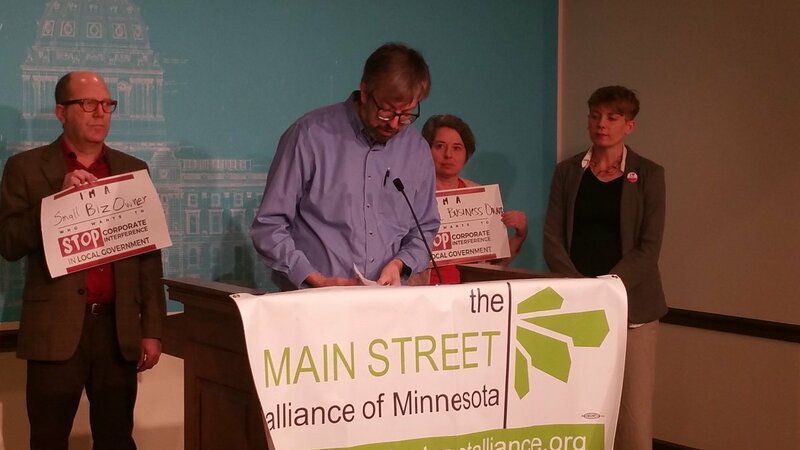 Main Street Alliance of Minnesota supports efforts to expand housing options, making it more realistic for Minnesotans to stay in or return to Minnesota. With smart partnerships, planning, and investments, we can build and retrofit energy-efficient housing that is affordable and close to workplaces, transportation options and downtowns. Paid Family and Medical Leave: Main Street Alliance of Minnesota supports the establishment of a statewide, publicly-administered, family and medical leave insurance program. A statewide insurance program will level the playing field for small “main street” businesses and make Minnesota more affordable for and attractive to young professionals and working families. Retirement Security: Main Street Alliance of Minnesota recommends that the state establish a public retirement option and make it available to all those employed by businesses that do not currently offer access to a privately administered retirement plan. Many small business owners do not currently have or provide a retirement plan to their employees. The public option should be accessible to sole proprietors, small business owners, and their employees. Earned Sick and Safe Time: Main Street Alliance of Minnesota recommends statewide legislation to ensure all Minnesotans have access to a basic level of accrued sick and safe time. We support a common sense, practical, and regional approach to earned sick and safe time in Minneapolis, St.Paul, Duluth, and across the State. The law should create a baseline standard that applies to all businesses and creates a level playing field for businesses who already provide comprehensive leave packages. Read our 2016 report: "The Bottom Line on Earned Sick Time"
In 2017, lawmakers attempted to strip power from cities and local governments with a series of "preemption" bills. MSA-MN small businesses made their voices heard against by testifying in committees, writing letters to the editor and calling legislators. On May 30th, Governor Dayton vetoed HF600/SF580, preemption of labor standards but signed the plastic bags preemption into law.